We’re committing to expanding our award winning inclusive business and philanthropic programmes to meet the unmet vision needs of 900 million people living with uncorrected refractive errors in the Commonwealth. This commitment will leave a legacy of improved vision care infrastructure and in addition, provide 200 million people living below the poverty line with free ophthalmic lenses. Comprising 53 countries, the Commonwealth has a population of 2.4 billion. It is estimated that 900 million people suffer from uncorrected refractive errors; approximately two-thirds of them live below the poverty line. Our commitment will be made in partnership through the $1bn Vision Catalyst Fund. The Fund is a new initiative under development by The Queen Elizabeth Diamond Jubilee Trust, civil society and public-private stakeholders, to provide sustainable solutions for eye health to entire populations in Commonwealth countries and around the world. Essilor has been working for many years to provide vision care at the base of the pyramid through inclusive business and philanthropic programmes. As creators of the largest rural optical network in the world, we address the two biggest barriers to good vision for all; access and awareness. By training primary vision care providers and creating last mile connectivity to locally-relevant product innovation, we have gathered unique experience deploying sustainable vision care programmes for the most underserved communities. Much like the ongoing fight to ensure children everywhere in the world are immunized against infectious diseases, civil society and public-private stakeholders must work together to immunize everyone against the negative impact of poor vision by making vision care universally available. We are at an historic moment where, thanks to the efforts of a diverse but united community, we have the potential to bring vision to everyone, everywhere within just one generation. Vision and development are closely linked. Poor vision impacts a person’s ability to learn, work, earn a decent income, to be safe and live an independent life. Improving vision directly impacts many of the United Nation’s Sustainable Development Goals. Essilor’s commitment deadline of 2030 is in line with the closing of the United Nation’s Sustainable Development Goals, with a clear objective to place vision care on the global health agenda. 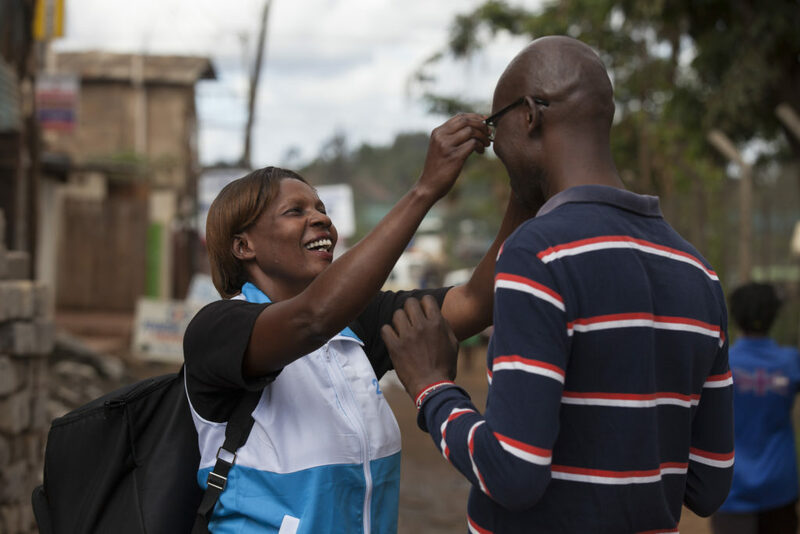 Essilor’s initiatives to bring vision care to the 2.5 billion people living with uncorrected poor vision include inclusive business programmes, strategic giving, raising awareness and advocacy. Partnering with others who support the cause of good vision plays a key role in these initiatives. Notable partnerships include the support of the Australian Government to expand Essilor’s inclusive business programmes into Bangladesh, and the selection of Essilor by the Indian State Government of Telangana to provide glasses to the millions in need.